Banana is a fruit well known it is easy to find in any supermarket or nearly all fruit and vegetable merchants. What is less known are the benefits of bananas. High consumption of bananas may reduce the risk of developing kidney cancer or colon cancer. It is also used against diarrhea to participate in the regulation of transit and even as an antacid when heartburn. 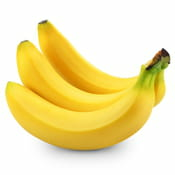 In addition, banana is a good provider vitamin B6, iron and potassium. Bananas are very popular sports because it helps fight against fatigue. It contains many minerals like magnesium and potassium as well as vitamins, such as A, B, C and E.
Rich in carbohydrates, bananas are recommended for snacks or teatime. 100 g de banane représentent 90 Kcalories. Original article published by Jean-François Pillou. Translated by Marjorie Gaulier. Latest update on December 4, 2013 at 06:50 PM by Marjorie Gaulier. This document, titled "Banana - Health benefits," is available under the Creative Commons license. Any copy, reuse, or modification of the content should be sufficiently credited to CCM Health (health.ccm.net).